One of the many problems encountered by individuals with autism , their families, and those who interact with them is the confusion regarding diagnostic criteria. Until May of 2013, an autism specialist might diagnose a child with autistic disorder, Asperger syndrome, Rett syndrome, childhood disintegrative disorder, or pervasive developmental disorder not otherwise specified (PDD-NOS). However, autism specialists tend to agree that these diagnoses do not accurately reflect the individual child’s deficits, given that the types and severity of symptoms children with autism experience vary widely. The new, official diagnostic criteria do not recognize autism types. Instead, they establish the guidelines for diagnostic criteria and symptom assessment. The new manual used to establish an autism diagnosis recognizes that the child must meet two criteria. The first involves social communication and social skills deficits. For example, the child may not be interested in playing with peers, may not participate in imaginative play, and may have trouble maintaining relationships. The child may also display lack of eye contact, and difficulties with body language, gestures, and facial expressions. Secondly, the child must display repetitive behaviors or unusual interests, such as hand flapping, lining up toys in a set pattern, being inflexible with regard to routines, or fixating on a particular interest such as trains. Additionally, the child may display repetitive speech and have atypical reactions to stimuli. Once a diagnosis of autism has been established, the autism specialist can consider which of three levels appropriately describes the severity of symptoms. Children with level one symptoms require support. They may be able to speak in full sentences, yet lack conversation skills, for example. Children who have level two symptoms require substantial support. Communication and interactions may be limited , and repetitive behaviors may cause social difficulties in multiple settings. Children with level three symptoms are considered to require very substantial support. They display severe deficits in verbal and nonverbal communication, social interaction, and behaviors. If you have questions about autism, the team at The Behavior Exchange can provide the answers. We’re on a mission to provide exceptional autism therapy near Dallas to help kids and their families overcome the many challenges associated with autism. To find out more or schedule a consultation with one of our autism therapists, call (972) 755-3804. When children with autism spectrum disorders begin ABA therapy and other educational programs early on in their development, they tend to have more success as they grow older and enter the traditional classroom environment. At The Behavior Exchange, we help lay the foundation of academic and social fundamentals with our Early Start or B.E.E.S. program, which is designed for preschool-aged children. B.E.E.S. utilizes the principles of ABA therapy but implements a group dynamic with a 3:1 student to teacher ratio. 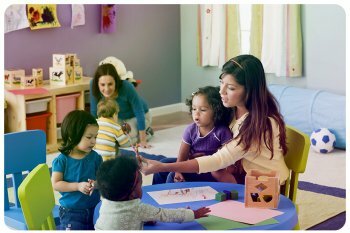 Children in this program will practice language, social skills, motor skills, and imaginative play to better prepare for school and gain a sense of appropriate social behaviors. If you think that your child may benefit from Early Start , call The Behavior Exchange today at (888) 716-8084. Our Dallas-area center will work with you and your child to develop a personalized plan for managing autism spectrum disorders with the ultimate goal of success in school and day-to-day life. Autism spectrum disorders and other behavioral disorders that children may face are best managed with a hands-on, ongoing approach utilizing therapies that produce consistent, measurable results. Applied Behavioral Analysis (ABA) therapy is a proven method in treating autism and related disorders that has been developed through more than four decades of applied research and case studies. At The Behavior Exchange in the Dallas-Fort Worth area, ABA is at the center of each program offered. These programs are intended to provide assistance in academic life and social interactions to give children greater opportunities for learning and discovering their unique talents. Below, you’ll get a closer look at the principles of ABA therapy to see how your child may benefit from this method. ABA interventions begin with an evaluation of a child’s behavior to determine areas where he or she is struggling. For example, a child may have difficulty learning in the classroom due to the restricted conditions of the typical learning environment. By recognizing specific areas where children are struggling with learning and social behaviors, tools such as positive reinforcement can help to increase positive behaviors and reinforce life skills. The goals of ABA are achieved not only through one-on-one sessions with learning specialists, but also through parent and family education to continue positive learning tactics at home for greater overall success. Objective improvement is measured throughout ABA with a baseline taken during initial interactions with the child. This helps to narrow down the most effective learning techniques for each individual and create a more efficient process in managing behaviors. ABA often has the most significant impact when interventions begin early in a child’s life, so you should not hesitate to connect with The Behavior Exchange if you suspect that your child has a behavioral disorder. You can reach us to schedule an initial consultation online or by calling (888) 716-8084.